When I say the word “bipolar,” what comes to your mind? Some of you may imagine someone like Robin Williams whose intense energy and rapid brilliance was so much a part of his public persona. His suicide has sparked much discussion of bipolar disorder, although that doesn’t seem to be the “reason” for his death. Others may think of someone like Winston Churchill, a much darker, more depressive character, who called his swings into depression “the black dog” and channeled what many believe was hypomania into long endless hours of work throughout the day and night. Or there are many others — Carrie Fisher, Mariah Carey, Demi Lovato to name a few celebrities who’ve revealed their illnesses. You may love someone whose moods vary from quite euphoric and highly energized to dark despondency — or you may have bipolar yourself — and know quite intimately how the rise and fall of mood can complicate your own life and confuse others who are trying to love you. To travel within hours or days or week from the desire to be engaged with others and the life of the party to being overwhelmed by a need to closet yourself off can feel very out of control and frightening. Just like most mental illnesses, however, bipolar disorder doesn’t look the same in everyone. And you may not recognize it, but you probably know someone who has it. Peter was a highly achieving, well-respected college professor who came in because he hadn’t slept in four days, a pattern that he was beginning to recognize had been a part of his life for years. Marjorie, a 20-something architectural student, was having a hard time reining in her thoughts, but she couldn’t find the energy to take a shower or care for herself. Stan, an elementary school principal, at work by 5:00 in the morning, was there for everyone and anyone who wanted some of his time. Yet he’d had secret thoughts of hurting himself and was fighting the urge to drive off the highway. All had some form of bipolar disorder. Could you tell from these facts alone? No. Sometimes the diagnosis is clear. Sometimes, not so clear. If you’ve been diagnosed, you might have been relieved by the hearing the word “bipolar” — it’s given you a structure to understand — it’s given you a plan. 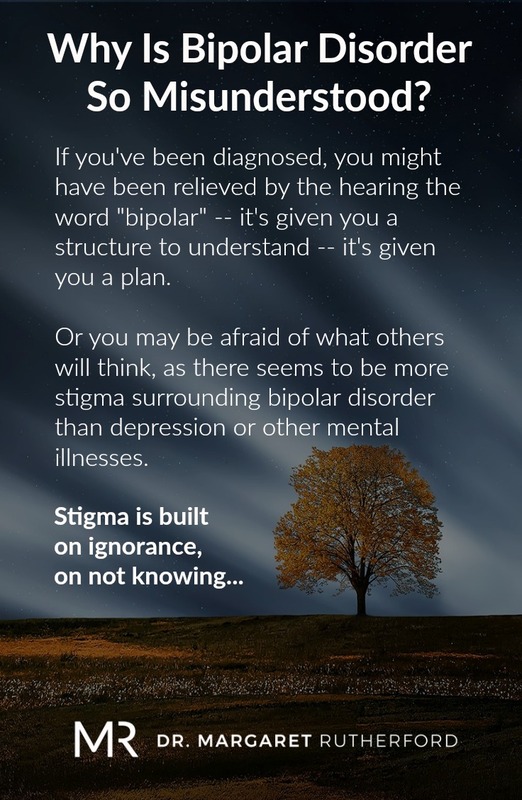 Or you may be afraid of what others will think, as there seems to be more stigma surrounding bipolar disorder than depression or other mental illnesses. Why is this? I’m not sure. It’s probably ignorance (hence this article). And it’s the fact that calling someone “bipolar” has come to mean “less than” or a slur on their character. Bipolar isn’t another word for just darn unpleasant. And shouldn’t be used for such. Bipolar disorder can be obvious. Or not. A psychiatrist I saw many years ago was convinced I had bipolar disorder because my natural energy was so high. He put me on a bit of Lithium, a mood stabilizing medication, which I stayed on for three days. I’ve not had three days quite like those again — way way overmedicated or mis-medicated. It was clear either Lithium wasn’t the drug for me, or I didn’t have bipolar disorder. Both statements turned out to be accurate. My mind had never raced uncontrollably, I’d always been a great sleeper. 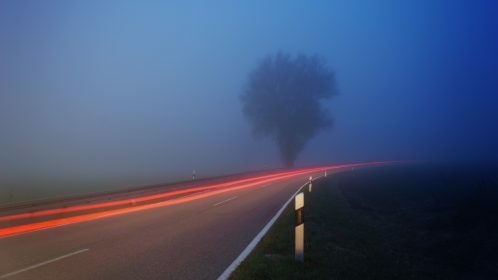 The earlier depression that I’d experienced had been triggered by a particular situation, rather than being tied to some inner cycle of mood that I struggled to control. Bipolar disorder wasn’t my issue — seeing a lousy psychiatrist was. My problem was anxiety. He missed it. Luckily, someone else did not. If you’ve been diagnosed with bipolar disorder or love someone who has been, you know that you can be productive and creative if you channel your energies carefully, and that your sadder moods will not last forever. Stan said at one point, “The most important thing for me to do is wait if I have a new idea, a strong emotional reaction or impulse. Wait and see if I feel the same way tomorrow. If I do, fine. If I don’t, I haven’t created a problem for myself.” You learn to look for triggers for either your moods zooming up or zooming down — things like going on a trip where your sleep cycle will be disturbed, or going through an anniversary of a death or loss — anything that will upset what, for you, can be a more unsteady balance between okay and not okay — stable or unstable. At times, it’s far from easy. And left untreated or undiagnosed, the disorder can cause quite a bit of havoc. So deciding to seek help and treatment can be vital. Make sure the person you seek has experience with diagnosing bipolar disorder. There are several movies about it, some of them fairly accurate, some of them way over-dramatized. But they might help you understand if you don’t. And knowledge is powerful. You can offer compassion and empathy for someone with bipolar disorder. You can learn what they’re dealing with on a daily basis. And if you have bipolar disorder, you can offer that same compassion to yourself. If you have bipolar disorder or any other emotional issues, you might want to thank the partner who’s helped you live through it and with it. Click here for “Marriage Is Not For Chickens,” a gift book by Dr. Margaret! You can hear more about depression and many other topics by listening to Dr. Margaret’s new podcast, SelfWork with Dr. Margaret Rutherford. Subscribe to this website and receive her weekly blog posts and podcasts!